Britons Non Stanford and Vicky Holland took a step towards qualifying for the 2016 Games as they finished second and third in an Olympic test event in Rio. 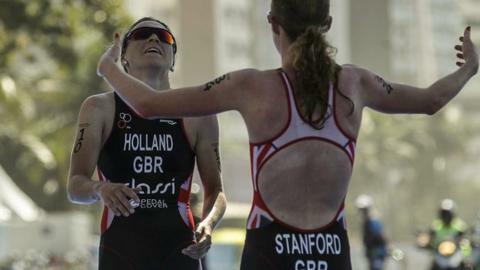 They will now qualify for the Olympics with a top-three finish at September's World Triathlon Grand Final in Chicago. "It was paramount I did well and it's boosted my confidence," said Stanford. Alistair Brownlee struggled with an ankle injury and finished 10th in the men's event after falling back from third during the run. Jodie Stimpson finished 10th in the women's event, while Helen Jenkins withdrew during the swim from a race that was won by American Gwen Jorgensen. Any British athlete finishing on the podium at Rio and Chicago is automatically pre-selected for the Olympic Games team. "It's a stepping stone - we had to podium in this race and now we have to podium in Chicago, so step one is done," 2013 world champion Stanford, 26, told British Triathlon. "It was fantastic to have Vicky up there on the podium with me - I think the more girls we can get qualified by the end of this year, the better." Brownlee, whose brother Jonny was already missing the race in Rio through injury, finished down a field that was led home by Olympic silver medallist Javier Gomez. "Alistair wanted to hang on to third place but his injury let him down today," said British Triathlon performance director Brendan Purcell. "His swim and bike showed again that can get into a winning position and he almost held on, so although it wasn't the result he wanted, there were a lot of positives. Meanwhile, GB paratriathletes secured five medals at the test event on Copacabana Beach - although those results do not count towards the British Paralympic selection process. Steadman led from start to finish in the women's PT4 race, with Faye McClelland securing a bronze behind her. Patrick came from behind to win the PT5 event for visually impaired athletes. She and guide Grace France were a minute down after the bike leg but ran brilliantly to secure gold. Melissa Reid, guided by Nicole Walters, had to settle for silver after Patrick overtook her. Andy Lewis took bronze in the PT2 category and Joe Townsend also had his best ever result with fourth in a very competitive PT1 event for wheelchair users. "Five medals meets our target for today. From the guys we have here, and the really strong fields, I'm very happy," said head coach Jonathon Riall. PT1 - Wheelchair users. Athletes use a recumbent handcycle on the bike course and a racing wheelchair on the run segment. PT2 - Athletes with comparable activity limitation and an impairment of, but not limited to, limb deficiency, hypertonia, ataxia and or athethosis, impaired muscle power or range of movement. In both bike and run segments, amputee athletes may use approved prosthesis or other supportive devices. PT4 - As above with less severe impairment. PT5 - Total or partial visual impairment. Competes with a guide.